Get the BEST discounts and help for you and your family from Alamo Rental Cars on your next vacation. Alamo will get you the BEST discounts in the car rental business. Alamo discounts SAVE you more money than ever before and are easy to get. The Phillips Mansion is located in Pomona, California and is a second empire style mansion that was constructed in 1875 for Louis Phillips, that had become the richest man in the LA county by the 1890s. The magnificent mansion sits alongside the Butterfield Stage route and soon became the cultural center for Pomona and Spadra and added to the National Register of Historic Places in 1974, helping it become one of the first 25 sites in the county to be put on the list. Phillips was born in Prussia and had come to the state of California in the 1850s. He came to Spadra, which has become a part of Pomona, in 1862 and started sheep herding and cattle ranching and in 1864 bought 12,000 acres of the former Rancho San Jose for $30,000. Louis married Esther Blake in 1867 and had three sons with her, Charles, George and Louis, Jr. and two daughters, Mrs. Frank George and an adopted girl named Kate Cecil. He began buying large plots of land in different parts of the county, especially in the Los Angeles business district and in 1892, the LA Times stated that Phillips, who lived rather quietly in Spadra, by Pomona, was now the richest man in the county and said his worth was not a dollar less than $3 million. The Times also mentioned that he had a ranch that grew wheat and produced honey and wool, besides his land holdings in LA county. The mansion cost $20,000 in the year it was constructed, 1875, and has been called being constructed in the second empire style or the classic haunted mansion style with three foot thick walls, six fireplaces and 16 foot ceilings. The bricks used for the house were actually produced at the site by Joseph Mulally of LA, and since the roof was of the mansard style, the mansion actually looked more like the New Orleans French houses. Another writer wrote that the house looks as if it had been picked up off a Midwestern street and brought here to be placed on its foundation. It looked like the kind of house that a banker would build for himself and the interior is done with maple and cherry wood that had to be brought here by horse and wagon from San Pedro. It was one of the first houses in many categories that included; first house made with fired bricks; first house with the mansard roof and the first house that had gas lighting. Besides the two Mexican period adobe houses, the Ygnacio Palomares Adobe and the Casa Primera, the mansion is the oldest house in Pomona Valley, and one of the ten most stately homes in southern California. The American Museum of Ceramic Art was started in 2001 and opened in 2004, becoming one of the few museums in the country that is dedicated exclusively to ceramic art and the historical innovations that have been made. It sits in a region that has a marvelous history of ceramics and internationally known clay artists from the 60;s Clay Revolution, the present Studio pottery era and the arts and crafts movements. The museum's building can be found in the urban downtown area where art has been part of the important elements of the continued and successful community revitalization program. There is a rich mix of ethnic and academic populations that are surrounded by 15 institutions of higher learning in the eight mile radius of the museum. It has grown into an organization of visions, completely dedicated to the arts, knowing that visual art experiences shown through the works of professional artists, gallery displays and workshops will encourage cross-cultural understanding for the mutual benefit of all. The exhibits and programs at the museum will continue to embrace a wider venue of topics, all pertaining to clay, and within the broad and diverse community, the museum strives to improve the aesthetic enjoyment of clay as an art form and to aid the community in discovering the creative thinking that goes into creating ceramic objects. AMOCA also strives to provide clay enthusiasts with a venue for camaraderie, encouragement and exhibition opportunities. When used as a teaching tool, clay and pottery have become one of the most enduring indicators of culture, allowing the past to be uncovered through the many exhibitions of archaeological discoveries, by studying the creation, glazing and firing practices that have been developed through time, allowing us to find the clues of social expression through the continued study of the shapes, styles and forms of decoration in clay. Budget Rent-A-Car is one of the best rental car businesses in the industry. Budget has the best customer service staff in the car rental business that are friendly and courteous. Budget has more SAVINGS for you today with the BEST car rental company in America. Ontario Intl. Apt. Budget Car Rentals - 3400 E. Apt. Dr.
Budget Car Rental Upland - 1784 W. Foothill Blvd. Duarte Budget Car Rentals - 1096 Huntington Dr. The Richard Nixon Presidential Library and Museum is located in Yorba Linda, California, the birthplace and final resting place of the 37th President of the United States. Sitting on a nine acre estate, the library and museum contain every piece of paper, letter, document and other materials that were related to the Nixon presidential period. Normally, the papers and documents of a U. S. president were his personal property when he left the office, but with the Watergate scandal and related concerns and the abrupt resignation more than complicated the matter. In September, 1974, Nixon was able to get an agreement made with the head of the General Services Administration, Arthur F. Sampson, that he, Nixon, would turn over the majority of his materials of his presidency, which would include the taped recordings that he'd had made in the White House; but, the recordings would have to be destroyed after September 1, 1979 if so told to do so by Nixon or by September 1, 1984 or his death. Fearful of losing those tapes, the Congress amended the Nixon-Sampson Agreement by passing S.4016, that was soon signed into law by President Gerald Ford on December 1974 as the Presidential Recordings and Materials Preservation Act. This law specifically addressed the materials from the Nixon presidency, instructing NARA to get the materials and process them as quickly as possible; allowing Nixon's personal papers to be returned to him. Because of that act, Nixon's papers and materials like the tapes were to be kept by the National Archives and not transferred to the library at Yorba Linda. The money that was used to construct the Nixon library was acquired from private sources, with an estimated cost of $25 million. Julie Nixon Eisenhower, the president's daughter, broke ground for the complex in December, 1988. The museum is contained in a 52,000 square foot structure, and offers a narrative of Nixon's life and career. His birthplace is located behind the museum, which had been built by his father using a homebuilding kit, and later rejuvenated to what it would have looked like in 1910. Richard and Pat are both buried close to the birthplace, but since California doesn't allow for the burial of remains on private property, the plot was deeded to a local church, which then classified it as a cemetery. The library also houses the Loker Center and the Annenberg Court, which is a 38,000 square foot wing, containing a special exhibit room and an exact copy of the East Room of the White House; this room is used for special occasions like weddings and other ceremonies, and under control of the Nixon foundation. The museum collection is massive, with photographs, clothing and memorabilia of Richard, Pat and their children. The collection also has a big number of bronze figures of world leaders that had had special relations with Nixon as either President or Vice President under President Eisenhower (1953-1961). The government limo that had been used by Nixon during his entire presidency, a customized 1969 Lincoln Continental is shown in the Domestic affairs gallery. Lt. Col. Gene Boyer, the president's chief helicopter pilot was able to get the President's VH-3A "Sea King" helicopter so that it could be exhibited on the grounds by the library. It was part of the presidential fleet from 1961 to 1976, and transported Presidents Kennedy, Johnson, Nixon and Ford, as well as many heads of state and government; and Boyer used it to fly Nixon to Andrews Air Force base on August 9, 1974. In January, 2004, under the George Bush administration, the United States Congress passed a law that would provide for the establishment of a "federally funded" operated Nixon Presidential Library. In other words, it actually nullified the Presidential Recordings and Materials Preservation Act of 1974, that had stated that the Nixon materials were to stay in Washington. Now they would be moved to the Yorba Linda location and operated by the Federal government. During the winter of 2006, NARA started to transfer 30,000 presidential gifts, and then later that year, they started transferring the papers, documents and tapes to the federal presidential library that included retrofitting the complex so that it could meet the standards for such places under NARA. The archives that had opened in 1994 had some 6.2 million pages of records with many photographs, recordings and film reels. About 46 million pages of official White House records have been stored in the NARA archives and are being or may have already been transferred to Yorba Linda. A new archives-curated exhibit about the Watergate scandal was to have opened in July, 2010, but had to be postponed when the Nixon Foundation filed a written objection to the new display. NARA then said that a committee would review the objection, but never said when that would be completed. Enterprise Rent-A-Car will give you the best selection of new quality cars to choose from and the best staff to help you with that decision. Stop by our friendly web site today and begin saving with the new Enterprise printable coupons that SAVE you some big money. All entrees include the Farmer's Market salad & soup, hot cheese bread and choice of FF, rice pilaf, or miner's garlic mashed potatoes; glory hole is petite filet mignon cooked your way topped with crab & asparagus spears, crowned with béarnaise sauce; miner's filly is filet mignon topped with béarnaise & sautéed mushroom; miner's angus top sirloin broiled; eastern prospector is 14oz. NY steak; miner's angus prime rib 16oz. ; NY grub steak is 14oz. Midwest beef topped with sautéed mushrooms, onions & bell peppers; miner's delight is petite filed mignon wrapped in bacon, topped with béarnaise sauce & mushroom cap; chicken teriyaki is grilled boneless breast of chicken topped with pineapple ring; chicken marsala with wild mushrooms & marsala wine; blackened halibut dredged in Cajun spices or au natural with lemon butter; roasted salmon with sauce shoron; BBQ pit menu; baby back ribs, chicken breast; ultimate BBQ feast is chicken breast, half rack baby back ribs & beef ribs glazed in BBQ sauce; shrimp scampi style sautéed with garlic butter & fresh squeezed lemon juice; shrimp scampi style with filet mignon; Alaskan king crab legs; Alaskan king crab legs with filet mignon; lobster tail from down under with filet mignon. Cold Starts; homos is cooked chickpeas sesame seed oil, fresh garlic & lemon juice; babghanouj is roasted eggplant, crushed with somane seed oil & lemon juice; labney is Mediterranean cream cheese with garlic & fresh mint; jibney beyda is white Mediterranean cheese; shanlishis Mediterranean cheese sated with chopped tomatoes, onions, parsley & olive oil; grape leave stuffed with rice & veggies, cooked with olive oil & lemon juice; kabis is selection of assorted pickles, olives & chili peppers. Entrees; mixed grill mshakkal is shish kabob, kafta kabob & chicken kabob grilled with basmati rice & grilled veggies; beef shish kabob is beef filet mignon grilled on skewer with basmati rice & grilled veggies; chicken kabob is chicken breast marinated with garlic & lemon juice grilled on skewer with basmati rice & grilled veggies; kafta kabob is two skewers of minced beef mixed with onions, parsley & spices; lamb kabob is lamb fillet grilled on skewer flavored with garlic & eastern spices with basmati rice & grilled veggies; Aladdin chicken kabob is two skewers of ground chicken, mixed with eastern spices with rice & grilled tomatoes; vegetarian kabob is combo of potatoes, green, yellow & red bell peppers, mushrooms, onions & grilled tomatoes with basmati rice. RentalCarMomma.com and Hertz Rental Cars have teamed up to give their customers the cheapest rates in the rental car business. Hertz has more locations across the nation that offer you the cheapest prices. Glendora Hertz Car Rental - 1947 Auto Center Dr.
West Covina Hertz Car Rentals - 2144 E. Garvey S.
The Pomona College Museum of Fine Art sits on the campus of Pomona College, in Pomona, California, at their Montgomery Art Center that was opened in 1958 and named after Gladys K. Montgomery, a trustee and LA civic leader. Some of the important and significant holdings includes the Kress Collection of 15th and 16th century Italian panel paintings, American and European prints, photographs and drawings and more than 5000 pieces of pre-Columbian to 20th century American Indian art and relics, beadwork, basketry and ceramics. Besides being available for exhibitions, these works are available for study and research and often used in classes for the students attention. The museum is also an active place for temporary or changing exhibits during the year, that include student and faculty shows, exposing the students to a diverse number of works and historical and contemporary shows that are created to complement the college's curricula. Current exhibitions include; Steve Roden: when words become forms that runs until December, 2010 and contains new paintings and a big scale installation that was created just for the event. It has sculptural forms, hand drawn film and video projections and sound compositions that create a sensuous materiality and is enjoyed by all. Steve lives in Pasadena and has made many paintings, sculptures, drawings, film and sound works over the past two decades to showcase his talents. Running from the end of August until the middle of October is the Project Series 41: Ginny Bishton, who has been creating photo-collages, minimal grid based drawings and brilliant hued collages of hand made soups photographed from above. And the last is Project Series 42: M. A. Peers, who has made paintings and drawings that pertain to the venue being discussed. In their collections of permanent works, you will find the Kress foundation collection, the Native American collection, Rico Lebrun's Genesis, the etchings of Francisco de Goya and Jose Clemente Orozco's Prometheus, 1930. The last piece was done in 1930, at the suggestion of Frary Hall's architect, Sumner Spalding, who had seen Jose's work and knew it would be the perfect venue for a mural. The artist was chosen because of the urging of Jose Pijoan, one of the popular professor's of Hispanic civilization and art history at the college. Orozco wasn't too well known in this country during that period, but he was invited to come here and paint the first Mexican mural in the United States, and later become known as one of the los tres grandes, the three great Mexican muralists; Orozco, David Alfaro Suqueiros and Diego Rivera. Jose arrived at the Claremont depot in March of 1930, and welcomed by a very enthusiastic crowd of Pomona students that would play an important role in his project. The faculty had been divided about the commission, but the students didn't care and wanted him to continue on with the project; even so far as to find ways to raise the money for his fee. As Jose painted on the mural, day after day, many of the people watching began to know more about him and his methods, which is still there today and the pride of the college. La Casa Alvarado or the Alvarado Adobe is one of the oldest historic buildings on Old Settlers Lane in Pomona, California, constructed in 1840, and declared a historic landmark in 1954 and put on the National Register of Historic Places in 1978. The casa can be found on a part of the old 22,000 Rancho San Jose that was granted to Ygnacio Palomares and Ricardo Vejar in 1837. Palomares asked his friend Ygnacio Alvarado to come and live on the ranch with him, giving him a piece of land near his home, La Casa Primera de Rancho San Jose. The land would be given to Alvarado if he would construct a chapel in his home that could be used for church services when the padres that came from the Mission San Gabriel Arcangel. He built a large living room or sala, that measured 18 feet by 42 feet and that room was used for services for the next 45 years. The Alvarado living room would also become the venue for the first public school classes in the Pomona valley, beginning in 1871 or 1870. Spanning 120 years, there were only three owners to the house, staying in the Alvarado family from 1840 until 1886, when it became the property of Dr. Benjamin S. Nichols and his family. Just before 1900, Nichols would add redwood framed additions to the house, bringing the total to 14, with five being actual adobe; and it stayed in the Nichols family for another 65 years. Isabel and Alphonse Fages bought the house in 1951, since Alphonse had been born in the city, and also was a descendant of Vejar, who had been the other co-grantee of the San Jose Rancho property. Isabel was also the descendant of early Spanish settlers and had been the president of the Historical Society of Pomona Valley, as well as being the editor of the official publication of the Native Sons and Daughters of the Golden West. The Fages purchased the house to rejuvenate it and preserve it; but had to sell off some of the lots that had come with the house, about an acre and a half, leaving them just an acre. On your next visit to Pomona, Avis Rental Cars will make your visit the best. Avis Rental Cars will help you choose the best vehicle for your trip and our friendly staff will help. Get the BEST discounts at Avis Rental Cars. Start saving money right away by going to our web site and see the great discounts. 5080 E. Montclair Plaza Ln. Although the Claremont Museum of Art no longer has walls to encompass it collections, it does have the collections, the people and the desire to continue the ever constant battle to regain its foothold on a brick and mortar structure that will house the collections and offer the public a marvelous venue once again. With that bright futuristic spot on the horizon, the museum is still a museum, but right now it is more of a web site with plenty of information and ideas about rebuilding or restoring, during these difficult times of a roller coaster economy ride. The museum idea began in 1987 by Marion Stewart, a local weaver and wife of sculptor Albert Stewart, when she and a friend had just left the Padua Hills theater, and talked about starting a museum inside the old theater. Marion talked with friend Marguerite McIntosh, who had been part of the art community for over 50 years along with her renowned ceramist Harrison McIntosh, who in turn began talking with two former mayors about starting a museum. As the theater began its restoration, another historic building became available, the College Heights Lemon Packing House that had been saved from the demolition ball and made a mixed-use structure. Its location in the downtown area and its historical importance helped to motivate the group into forming the Claremont Museum of Art that was incorporated in 2004, and in 2006, their board announced it would open the museum in the packing house. The new museum would showcase the works of the local artists in a permanent location, as well as expanding its mission to include showing works from around the nation and world, thus making the museum more important as a regional museum of international significance. However, as the economic depression or recession or whatever it is called, continued, the grand plans had to be scrapped and the board decided that the museum couldn't afford the staff and space, although funds were constantly being raised through various venues and events. Presently the board is trying to reorganize the museum, in the meantime amassing a large body of volunteers and hosting numerous events and occasions to gain the necessary funds to reopen. The San Gabriel Valley contains hundreds of avid artists from every possible venue of artistic talent, that were born here, raised here and continue to live and work here, one day hoping that the museum will finally reopen and offer them a place where they can showcase their talents and encourage the community to become more involved and interested in the art of today and yesterday. The Ygnacio Palomares Adobe is also called the Adobe de Palomares and is located in Pomona, California, where the one story structure was built between 1850 and 1855 as the primary residence for Don Ygnacio Palomares. During the 1880s, it would be abandoned and left to the elements and other destructive forces until the city acquired it in the 1930s. Then, in 1939, it was rejuvenated by a joint project of the city, the WPA and the Historical Society of Pomona Valley. Beginning in 1940, the adobe was opened to the public as a museum about life in the Spanish and Mexican ranchos, and then listed on the National Register of Historic Places in 1971. With over 400 sites being located in the Los Angeles County region currently listed on the register, less than 10 were received before the Palomares adobe. The adobe had been the centerpiece of the huge sprawling 22,000 acre Rancho San Jose which had been taken away from the Mission San Gabriel in 1834 as part of the secularization decree by the new Mexican independent government. Mexican governor Juan Bautista Alvarado in 1837 granted the land to Ricardo Vejar and Ygnacio Palomares, who had been native sons of the Spaniards, and the land that once held the ranch is now parts of the areas known as Claremont, Pomona, San Dimas, Azusa, Glendora, LaVerne, Walnut, Diamond Bar and Covina. Palomares originally stayed in the Casa Primera, the earliest adobe owned by the historical society and constructed around 1840, which is mentioned in the portion above. Then, sometime between 1850 and 1855, Palomares constructed a new house, where the current historic site lies and was an adobe 13 room home shaped in a T with a courtyard. The living room and master bedroom were sitting at the stem of the T, with four more bedrooms, tienda or storage room, dining room, storage chambers, kitchen and storeroom. The kitchen sits at the north end of the T, near the outdoor oven or horno, and is a blending of Mexican adobe and American styles with milled roofing and flooring in the adobe building. The adobe was used for an overnight stagecoach stop on the trail between Los Angeles and San Bernardino and had a store for settlers where they could purchase goods and supplies. The ranch seemed to prosper for many years until the early 1860s when a bad drought came and destroyed most of the crops, and then smallpox came and took three of the five children as well as Don Palomares in 1864. His widow, Dona Concepcion Lopez de Palomares, who was also called Dona China, started selling off parts of the ranch to survive in 1865, but in 1874 another child passed on and the Dona sold off the last 2000 acres and the adobe for $8 an acre to Alvin R. Meserve and John R. Loop. The Meserve family would stay there for many years, although by the mid 1880s, the place was deserted and abandoned. Thrifty Car Rental has been a staple in the car rental business for many years. Our customers will get the biggest selection of new quality cars to choose from and the friendliest customer service to help you with your selection. Thrifty is offering printable coupons on their web site today with BIG savings. The Armstrong Gallery in Pomona, California is one of the best fine art ceramic galleries in the nation, and they are difficult to find, especially one like this that houses a large inventory and collection of fine art ceramics. The large number of artists that the Armstrong represents have been showcased in Ceramics Monthly and invited to workshops all over the nation. The gallery has amassed a marvelous collection of salt fired, primitive fired, wood fired, oxidation fired, raku fired and once fired vessels and sculptures. You will discover magnificent ceramics in the form of lugged vessels, cups, plates, tea pots, bowls, chargers, mugs, vase forms, pitchers and platters; as well as nonobjective sculptures, l'oiel sculptures, abstracted sculptures, woodfired sculptures, sculptural vessels, sculpture fire with sticks, soda fired sculptures and monumental porcelain sculptures. The gallery has a large number of glazing options available to you that includes; dolomite glaze, shino glazes, raku glazes, low fired glazes, crystalline glazes, once fired glazes, timoku glazes and luster glazes. The owner, David Armstrong is a great collector of ceramic art, as well as a ceramic artist, community leader, producer of ceramic collectibles and the last student for Paul Soldner. To name just a few of the many talented artists included in the huge list; Harrison McIntosh, Fong Choo, Lance Henrikson, Joe Koons, Emily Rossheim, Jeff Shapiro and Georgette Unis; and many more. Some of the outstanding exhibits that are being shown at the Armstrong include; the 3rd annual Mata Ortiz exhibition that runs until the middle of October, with plenty of Mata Ortiz pottery, right from the small village in the state of Chihuahua, Mexico. La Casa Primera de Rancho San Jose is the oldest surviving structure in Pomona, California built in 1837 and listed on the National Register of Historic Places in 1975 and declared a historic landmark in 1954. As mentioned earlier on this page, the Rancho San Jose was part of the land that was seized from the Mission San Gabriel Arcangel in 1834 when the new Mexican government decreed a law of secularization, and in 1837, the governor, Juan Alvarado gave the land as a grant to two men named Ricardo Vejar and Ygnacio Palomares. The land grant amounted to 22,000 acres with the majority of it being in the eastern Los Angeles County and operated as a sheep and cattle ranch by both men. 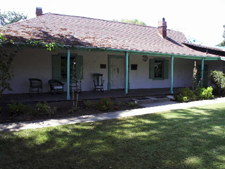 After getting the grant, Palomares constructed an adobe house in 1837 on the land that is now part of Pomona; it was a five room adobe house, that became known as the Casa Primera and the first house in the Pomona Valley. The adobe was constructed in the Mexican style of adobe houses, with thick adobe walls, while Palomares and his family lived there for 17 years, as he began to construct a much bigger house of adobe that he called the Ygnacio Palomares Adobe. In 1867, Palomares' son, Francisco moved into the adobe with his wife, Lujardo Alvarado and found an artesian well that would become the first such type of well discovered in the valley that supplied plenty of water for personal needs and for Francisco to be able to plant an orange grove, many that were still doing well in the 1970s. Using the well as a water source, Francisco and some partners created the Old Settlement Water Company in 1874, with much of its former stone lined canals still viewable in the area today. Francisco lived in the adobe until his passing in 1882. After his passing, the casa was bought by Dr. Benjamin S. Nichols who also bought the neighboring La Casa Alvarado and took over as the President of the Pomona Land and Water company. He sold the place to Roscoe Hart in 1947 who stayed there until 1972, at which time he sold it at public auction, which was won by a bid of $85,000 to the historical society. They refurbished it and installed period furniture and furnishings and opened it in as a historic museum in 1973. When you want the savings and the most reliable vehicle, use Dollar Rent-A-Car. You know that you will get the best deal on a new quality vehicle when you use a company that has a name like Dollar. Dollar Car Rentals are offering their BIGGEST SAVINGS of the year now. Pomona Dollar Car Rental - 1180 N. White Ave.
Dollar Rental Car Ontario Intl. Apt. - 3450 E. Apt. Dr. The Pomona Valley Art Association began in 1952, after a group of painters had met in Washington Park in Pomona, California in 1948, when they held their first exhibition, and became such a popular venue that it decided to organize into the art association of today. All through the following decades, the dedicated members and friends have continued in serving the community, helping to increase the understanding of art and the appreciation of it, while at the same time helping young and budding artists and artisans showcase their finest works of art. They are proud that many of their members have achieved national acclaim and recognition like; Don O'Neill, Milford Zornes, David W. Scott and Betty Davenport Ford. The Gallery SoHo is the nonprofit co-op gallery that is run and staffed by volunteer artists, each one a member of the PVAA, and is the perfect place for new and old artists to showcase their works; and are always open to new artists needing a place to show their works and even sell some to support themselves. The list of artists showing their works at the gallery is long but there are some that are worth mentioning like Raul Capella, Rita Dushane-Jones, Corrine Gomez, Jim McClure, Maia Peters, Rita Poorman, Wade Stanley, John Wolfskill, Sindi Wasserma and Jan Wright. There are many other artists that have pages on the association's web site showing what kind of talent these folks have, and still continuing to work at outside positions until they are certain that they can make a good living at their dream jobs. These are really exceptional artists, each one different and quite mesmerizing in their individual field of expertise. There is a good place to start and decide if you are a fan or artist yourself, but in the meantime finding outstanding artworks where you can to enjoy and relieve the stress in your day and life. The Diamond Bar Golf Course in Diamond Bar, California is a full length 18 hole par 72, 6802 yard golf course with putting greens, chipping green, driving range from 75 to 250 yards, pro shop, Diamond View room with views of the marvelous San Gabriel Mountains and much more. The club was started in 1964 by the county of Los Angeles and then in 1987, the Club Corporation of American took over the management of the course and during the years that followed, many millions of dollars have been spent to make sure that the course and club is one of the finest in the region. It was named the Club of the Year in 1997 by the Club Corp. of America Western Region for public courses. Their banquet room is available for many occasions including weddings, bar mitzvah's, wedding receptions, anniversary parties and quinceanera's, with seating from 100 to 250. The outstanding menu is handled by their executive chef, specializing in both continental and exotic cuisine with 45 excellent menu items. Their pro shop carries all the right equipment with a full line of clubs, clothes and accessories, as well as special ordering anything you want or need. They even will regrip your handles for you while you sit and relax over a drink or two. Their golf pro is available for golf lessons, regardless of your skill levels and offer group rates for the bigger groups like a business or shop. Water hazards are located on holes, 1,8,9 and 11 marked by yellow stakes and lateral water hazards on holes 2,3,8, 10 and 17 marked by red stakes. There are other obstructions and sand traps that will make this a great course to test your skills and use every club in your bag. National Car Rentals' friendly staff and quality cars selection will make sure your trip or vacation is more enjoyable. Start saving money today by making your reservation at National Car Rental with more locations around the nation that offers the cheap rates you need.